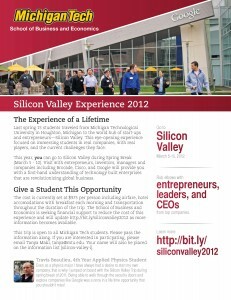 A generous donation has come through in support of the Silicon Valley Experience scheduled for March 5-9, 2012. With this funding, a competitive scholarship of $675 will be offered to 15 students. The scholarship will reduce the $975 price to just $300 and will include airfare, lodging, and transportation during the entire trip. There is also an option to participate for one course credit (you will be billed for one-credit hour with a $975 lab fee, see below**). Students will be responsible for paying for meals. Students will be visiting technology-driven companies including Google, Facebook, Intel, Plug and Play, Brocade, etc. More details about the Silicon Valley Experience. The trip is open to all Michigan Tech students enrolled in courses for spring 2012. Due to the quickly approaching deadline for airfare tickets, the School of Business and Economics will be following strict deadlines for this scholarship opportunity. To apply for the scholarship students must submit their name, email address, major, and two 500-word essay responses by Wednesday, January 11th. Please submit your answers to Lynn, lmczarne@mtu.edu no later than 4pm, Wednesday, January 11th. You will receive a confirmation email after the essay responses are received. Students will be notified about the scholarship by email on Friday, January 13th and will need to commit to the trip by paying the remaining $300 by noon of January 17. Responses submitted after the 4pm deadline on Wednesday, January 11th will not be considered. **The course in Banweb is BUS 4900: Silicon Valley Business Exp and CRN 14756. This course would not count as a co-curricular. If you have concerns about how this course would fit into your degree audit, please contact your academic advisor. You do not have to register for the course to be eligible for the scholarship opportunity. Questions can be directed to Lynn (Czarnecki) Makela, lmczarne@mtu.edu.